A few years ago I came across the obscure offence of refusing to aid a constable, which is a misdemeanour at common law. It doesn't appear in the list of offences in Crimes Act 1958 s 320, so is punishable by up to 2 years jail by virtue of Sentencing Act 1991 s 113C. And the offence is not listed as one triable summarily, so must be determined at trial in the County Court. The offence is mentioned in only two reported cases. The first is R v Brown (1841) C & Mar 314. Most of the judgment is filled with reciting the charge — which is almost longer than some entire summary briefs the police prepare these days! Daniel Herbert was a constable who — rather bravely in my view — tried to break up a public prize-fight, which was apparently illegal at the time. I say he was brave, or perhaps just reckless, because there were around 400 people there, and they decided they didn't like their prize-fight being stopped by just one police man, and instead settled on a good ol' fashioned riot. Mr. Brown, I charge you in the Queen's name to aid and assist in quelling this riot'; the defendant said that he could not, as he had his horses to take care of; the defendant was then sitting on the box of a carriage which had four horses and was driven by postilions; the defendant had not the care of any horse; I charged several other persons to assist me, but I received no assistance from anyone; the fight continued a long time after this; I saw Mr. Smith, who is a county magistrate; I assisted him in endeavouring to stop the fight; I took several persons into custody, but they were all rescued; I saw several acts of violence committed, and I saw Mr. Smith struck on the hat and a bottle thrown at him. The accused refused to render assistance without any lawful excuse. Mr Smith was found guilty, but the case does not record what penalty he received, or how the injustice to the magistrate's hat was remedied. That case was heard by the old Quarter Sessions — equivalent to our County Court — comprised by Erle CJ, Martin B, and Keating, Mellor and Lush JJ. The Brown brothers put up a fight, and the constables asked Caleb Sherlock to help them. He refused. Here, the first element of the offence was modified slightly, requiring only the more general need for a constable to be acting in the execution of duty, which could include preventing an assault or a breach of the peace. Sherlock's conviction was upheld. No ... surprise, Sherlock. 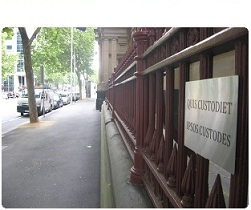 In Victoria there is no positive statutory duty upon citizens to aid the police. However, echoes of the common law offence sound in provisions such as the Police Assistance Compensation Act 1968 s 2, and also the offences of assaulting a person aiding a police officer, contrary to Crimes Act 1958 s 31(1) or Summary Offences Act 1966 s 52(1), and the power of arrest in Crimes Act 1958 s 458(1)(b) provided to citizens requested to assist a police officer who themself possess a power of arrest. I don't know though that we are likely to see a flurry of requests from the police any time soon, or of charges of refusing to assist a constable upon request. None of the various UK agencies seem to keep data on the offence, but one old (purported) CPS record shows 2 prosecutions of the offence in 2006, but nothing after that. The offence certainly still exists, being noted with approval by the House of Lords in R (Laporte) v Chief Constable of Gloucestershire Constabulary  2 AC 105 at 142 , but has never received judicial consideration in Australia. In any event, the second element requiring that a request for assistance is based upon necessity suggests this is not just some common-law equivalent to a charge of hindering or obstructing the police, but rather one of refusing to come to their aid in situations of emergency or some physical threat. On the occasions when that problem might arise, I imagine the police will rarely have the opportunity to chase up Joe Citizen who doesn't jump in to lend a hand. In that respect, it's probably similar to the offence of failing to yield to an emergency vehicle, often ignored because there are more important things to worry about at the time.